Welcome to Liquid Edge Sailing School and Yacht Charters. We offer training on both Mono Hull and Catamarans all fully endorsed by International Yacht Training (IYT). For charters we cater to families, parties, Hens parties and more with pick up from various locations around Sydney. We offer courses from beginner “Learn to Sail” to advanced. We are Bareboat Training specialists and offer the ICC Certificate for Europe. More advanced courses and packages are available. We can arrange private training for couples or groups who do not want to sign up to a structured course. Learn to Sail on a Catamaran. Ideal for those want to go cruising, coastal or ocean crossings. If you are thinking to purchase, this is a great starter course with experienced Catamaran sailors. Skipper a yacht in Europe – essential for charters or simply sailing the Med in your own yacht. Skippered Charter on a Mono Hull or Catamaran – we have yachts catering from 2 to 14 people. Sail to a quiet bay, have a swim, enjoy Sydney Harbour views from the water in the comfort of a modern cruising yacht. Ideal for groups to 14 for parties, sailing, stop and swim in a quiet bay and more. Catamaran Yacht Charters are one of the best choices for larger groups. Our Seawind Catamaran has plenty of space, BBQ and entertaining. We cater for Sydney’s famous Special Events on water, New Years Eve, Boxing Day, Australia Day, and other dates. We are also available on Xmas Day. 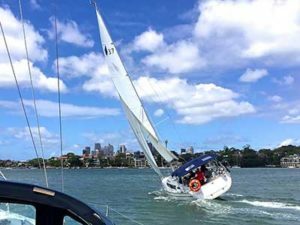 Liquid Edge Sailing School is currently running Fast Track Sailing Courses for the ICC or International Certificate of Competence in Sydney. Courses are available on either Mono Hull or Catamaran. The course is run over 5 consecutive days with the exam at the end. Live aboard the yachts is available. Liquid Edge small company known for personal and easy going service. We have strong repeat business due to the quality of our teaching and other services. We own and maintain our yachts, based in Mort Bay, Balmain – only ten minutes from the inner city wharves of Darling Harbour and Sydney. Our current fleet comprises of a Seawind 1000 Catamaran and Bavaria 37 both set up for training. The Bavaria 37 was purchased new and is set up for offshore and Coastal Sailing.